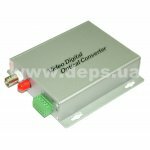 This class of equipment provides transmission of analog video and audio signals, as well as control signals to longer distances (2, 20, 60, 100 km) per optical cable in digital form. High noise immunity and reliability of this equipment allows creating on its base scaling video surveillance systems. When using along with multimedia switchboards one can possible to create conference-communication system, as well as system of transporting air-video signal from studio to head station. Models with 64 video ports have modular system that allows flexible use of equipment capacities.